How Much Does Asphalt Shingle Roof Installation Cost? Asphalt shingle roof, also known as composition roofing, is a durable yet affordable roof surface. In addition to asphalt, it consists of fiberglass and stone or slate granules. This product will usually last longer in regions with cold weather, making the extremely popular. 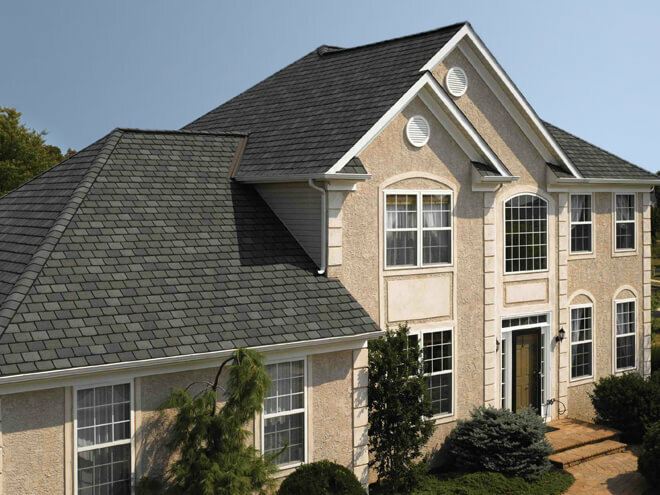 Although asphalt shingle roof installation can be done on your own, it does require a degree of experience and knowledge, so most homeowners use professional roofing services. This helps them avoid potential mistakes that could lead to injuries, ceiling leaks, gutter damage or a failed installation project. How Much Will It Cost To Install an Asphalt Shingle Roof? Shingles come in several types, but this article will deal with asphalt shingles which average around $1 - $4 per square ft. It's important to keep in mind that when dealing with roofing industry contractors, 100 sq ft (10 ft x 10 ft) is often referred to as a 'square'. In this case, 1 square can cost between $100 - $400. This cost should also include removal of old roofing materials alongside the new roof installation, but there are several factors to consider before your overall cost can be calculated. Most shingle roofs have problems because of mistakes made by the installers or because the shingles are simply really old and need to be replaced. It's always advised to consult with a knowledgeable contractor regarding your asphalt shingle roof installation, and compare at least 3 quotes from professionals in your area before you commit to doing business with anyone. Should you try a DIY asphalt roof installation on a standard ranch-style house of about 1,700 - 2,500 sq ft ( 17 - 25 square ), you should be spending around $1360 - $2,500 ($0.8 - $1 per sq ft) on shingles, which should be enough to complete the job. Unfortunately, DIY jobs often end up costing a lot more when inexperience is the cause for expensive mistakes. On average, the cost to install an asphalt shingle roof through a professional contractor for the same size property will see most homeowners pay anywhere between $1 - $4 per sq ft. Most homeowners, however, can expect to spend in the region of about $7,100, but the cost can vary anywhere from $1,700 - $30,000. Labor is normally one of the biggest expenses for homeowners who hire a contractor. Labor will cost anywhere around $4,500. Expect to pay about $4 more per square foot if workers must remove and dispose of any existing shingles before installation begins. The texture, quality, thickness, width and color of the shingles you ultimately choose will also have an effect on the overall cost to install your asphalt shingle roof. Thicker or wider units normally fetch higher prices. Another important consideration is the height and slope of the roof. Contractors charge extra if they need to use taller ladders and additional safety gear. Should your roof have some rot or damage and your contractor is required to remove and dispose of any material before installation commences, budget for anywhere around $1 - $5 per sq ft on the cost to install the asphalt shingle roof. Additionally, if your roof is in need of some reinforcement to handle the extra weight brought on by some heavier roofing materials, you can expect your cost to increase dramatically depending on your unique set of circumstances. Expect to spend anywhere between $1,000 - $10,000 over and above your overall cost to install your asphalt shingle roof if you need to reinforce it with rafters or trusses. Although it isn't quite as significant as most of the abovementioned factors, your location also has a considerable effect on the rates for an asphalt shingle roof installation project. Roofing contractors have different materials, tax, insurance, marketing and equipment expenses in almost every state. This service involves transporting workers and numerous heavy materials, so local fuel prices also play a factor in the cost to install an asphalt shingle roof. For a definitive estimate on the cost to install your asphalt shingle roof from top contractors in your area, simply enter your home zip code in the space provided below. It's a 100% FREE, no-obligation estimate offer. Comparing estimates is a great way to get a feel for pricing trends in your area, so enter your details now to reach out to a contractor in your area for some FREE assistance. Prices may vary based on your unique circumstances, so contact a professional near you for a more accurate breakdown of the cost to install your asphalt shingle roof.